The eHit clearomizer is an interesting new design that is one of the easiest to use for new vapers. Viper Vape carries them singly as well as part of an eGo style kit and recently offered one for review. 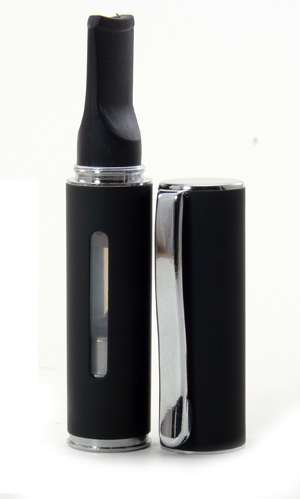 At first glance, the assembled eHit can easily be mistaken for an eGo-W with its pen cap and windowed metal clearomizer tube. As with the eGo-W, the eHit is designed for the eGo and its identical diameter makes for a great looking device when paired with the eGo battery. It utilizes the outside threads of the eGo battery, so regular 510 connections will require an eGo adapter. The inner tube slides in firmly and securely and the soft plastic mouthpiece connects snugly onto the top. A nice feature is the pen cap that screws on easily, not only protecting the mouthpiece, but making for an attractive and inconspicuous electronic cigarette as well. Inside there is quite a bit of improvement over the eGo-W. Where the latter required a blunt needle to fill, the eHit has a reservoir in the middle that can simply be dripped into. In addition, the coil on the Ehit is incorporated into the bottom of the tank as opposed to the top coil and wicks of the eGo-W, likely making for a more trouble free experience. Filling the eHit is about as simple as it gets. Just remove the mouthpiece and a small inner soft cap and fill up the tank. 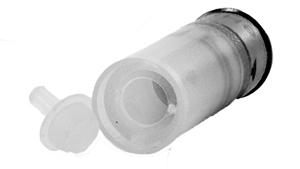 There is very little worry of getting liquid into the air flow area around the outside of the tube. Because the coil is at the bottom, it is also saturated faster and more easily than in a top coil design. Clear windows along the side of the metal cover make it easy to see the level of liquid remaining. The specifications call for a 1.2ml capacity and that seems about right. When describing the performance of an atomizer or cartomizer, there are several factors such as vapor production, throat hit and reliability that come into play. In the case of the eHit, two out of three ain’t bad. This design seems to have been tailored to reliability, with good flavor on every inhale and at various voltages. Through a couple of tank fulls, there have been no harsh or burnt tasting hits whatsoever. Leakage is also nonexistent, and it looks like nothing short of leaving the cap off of the inner tank would cause it. The eHit produces quite a lot of vapor with good flavor, at least after a minimal break-in period. The warmth of that vapor is where it falls a little short. The 2.4ohm measured resistance could not be expected to provide a hot vape on an regular eGo battery, but regardless of the voltage or the length of the hit, the vapor always seems a little cool. I suspect that this is a result of the design of the airflow rather than poor performance of the coil. As the vapor passes around the outside of the liquid chamber, the outer shell may be acting to transfer heat away from the vapor as it passes through. The base of the eHit actually becomes quite hot to the touch after repeated use, so the coil is apparently doing its job. Put all this together and the result is an exceptionally easy to use clearomizer that would be a great recommendation for a new user. Most cartomizer alternatives are more difficult to fill and more prone to performance issues that may give a new user a bad first impression. Viper Vape has added this clearomizer to their lineup primarily aimed at the new user, and it’s a good fit. 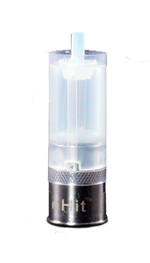 The eHit is a good example of a clearomizer that is likely to provide a simple and satisfactory first experience with a minimum of issues, even if the vapor is a little on the cool side. Note: The eHit reviewed above was graciously offered by Viper Vape for this purpose. As always, we are grateful for the free trial, but try our best not to let it get in the way of an honest review.